Seattle’s amber-voiced indie-folk artist, Shelby Earl, wasn’t born a songwriter. She became one. And in the words of NPR’s Ann Powers “she writes for those of us who’ve been through a few things.” Earl recognized from long stints in other bands, singing other people’s songs, that she was moved to do more – to become the kind of generative artist she’d long admired. The break up of her band The Hope in 2007 began Earl’s search for a role beyond being just “lead singer.” It was that search, and her belief in the rewarding work of songwriting, that led Earl to quit her corporate job in 2009 and start sharing her astoundingly powerful songs. 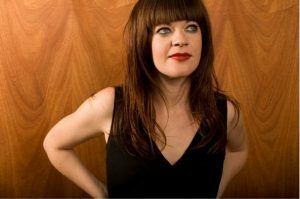 In 2011, she released her debut solo album Burn the Boats, produced by John Roderick of the Long Winters, on Local 638 Records. The title was inspired by her stepfather telling someone that Earl had “pulled all the boats ashore and burned them” to live her dreams. I started writing these songs while I was making my first record, Burn the Boats. It wasn’t a case of me listening to those who said; “by the time you release a record you should have your next one written,” things just sort of unfolded that way naturally. Life keeps happening while you’re working on a project, so there was plenty of new inspiration to work from along the way. Interestingly, it was “Mary,” which is in many ways the simplest song on the record. But I think it was difficult because it’s so delicate and it was challenging to know how much or how little to add to the track. It also took me quite a while to finish it in the writing stage – for similar reasons. In the beginning there were more lyrics and there was an actual chorus. But I was very patient with the song because it was meaningful to me. I sort of waited for it to solve itself. In the end I realized the verses and the refrain said everything I needed to say and so I cut out the rest. “Swift Arrows,” the song, had a completely different feel when I wrote it. In Damien’s words, it sounded “like an indie rock car commercial.” Heh. But he loved the content. He said; “the melody and the lyrics are amazing, but it shouldn’t feel like this.” He suggested slowing it down and making piano the primary instrument instead of guitar. Jacob James, who played most of the piano on the record, was there in the studio when we had this conversation so I showed him the chords and we worked it out on the spot. Eric Howk, who played primarily guitar on the record, grabbed a bass and wrote the bass part right there too. We tracked it immediately – live in the room together, just bass, piano and lead vocals. So what you’re hearing on the record is a real-time creation in many ways. And I think Damien was exactly right about how that song was meant to feel. It’s one of the ones I’m most proud of. In total, there were 13 musicians who played on the record (not including the big choir of pal singers). The main band that tracked together live consisted of Ben Obee (bass), Eric Howk (guitar), Ragan Crowe (guitar), Faustine Hudson (drums), Jacob James (piano) and me on acoustic guitar and lead vocals. Then Anna-Lisa Notter and Mike Notter (Hannalee), Damien Jurado, Rachel Flotard (Visqueen), Barry Uhl (Cloud War/Damien Jurado), Valari Uhl, and Dylan Rieck (Balmorhea) added overdubs. There were a lot of good pals involved and the whole process was a blast! Damien Jurado produced the record. His overall production plan and approach to recording hugely affected the resulting sound. Damien makes records live – in single takes – this is what he believes in. There are VERY few do-overs when working with him. This meant we had to be very well practiced going into the studio because he wanted us to PERFORM for him and he only wanted the most honest moments on the record. All the lead vocals were tracked live in the room with the band (or with Ragan, Eric and me on acoustic guitars). Damien was aiming for a big, lush, live sounding record that was totally honest, and he got it. If you come hear my band play live, this is what you’ll get. It felt like a very risky way to make an album, but I love the resulting life and energy in the recording. We have started playing these songs live. Some we’ve been playing for a while, some were just debuted at the album release show. Thankfully, a lot of the songs are eliciting strong responses from the crowd, but they’re quite different responses. The song “Mary” seems to bring tears to people’s eyes, “We Will Die,” “Sea of Glass” and “The Artist” all seem to make people smile and want to sing along, “Grown Up Things,” “The Seer” and “The Blue Girl” gets them all riled up and makes them hoot and holler once the band strikes those the final chords. It’s exciting to see the songs come to life in a new way in front of an audience!